What a breakfast Dave and I have shared today! I prepared the final 3 recipes for Blackbird's Country Inn book. The featured quilt in the book is done both by Barb and me. You had a glimpse of mine on the last post. Barb's is done in soft greys and reds. As we give the pattern for each block we are including a breakfast recipe served at the Country Inn. Today was an egg casserole, scones and broiled grapefruit. The background of the picture above shows the "set-up" for the shot. The foreground is the pan these were cooked in....and the remains of the one I couldn't resist. Lots of work....but fun work! This has to be a very short post as there is still much to do to prepare for our photography on Saturday. Tomorrow a great show and tell. I have received many wonderful pictures and it's time to share them with all of you. That grapefruit looks wonderful , how very elegant !! Im reading Liz's Merchantile by Jodi Barrows. A quilting novel , very interesting about an old Texas family starting out in Dallas and all those ladies are quilters. She has free videos on her site by the way although I prefer hand quilting myself. I just can't wait to see your new book! Couldn't help noticing that homemade potholder in your picture. Were your boys into making potholders? My daughters use to make them and now my grandaughter is making them. Can't wait to see the pictures of both of your quilts. Oh my gosh I am 59 tears old and still own my pot holder I made with my mother way back when. I am so happy your book is almost done I am lookingh forward to purchasing it. ohh....I love scones...and I'm on a diet!!! Interesting recipe. How did the grapefruit come out? I love reading your blog. I love using the woven potholders. They are my all time favorite. My kids made some....but the one who really made the most potholders is my niece Sarah. She made about 10 for me. We even had a photo shoot of her potholders. Lots of fun. She did a great job....the sad part is I use them and they get a bit worn. broiled grapefruit? How intriguing! You always make everything look so pretty no matter what you do. I'm so looking forward to that book! I guess the quilt pattern is in the book along with all of the recipes? 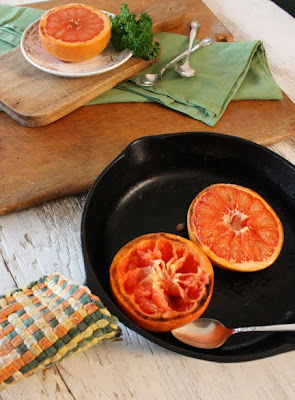 Never had grilled grapefruit and will give it a try. Hi Alma, I absolutely love all your designs & especially the "When the Cold Wind Blows" book with the Red, Blue & Brown "Love Letters" Quilt...Question...was there a specific collection of fabric used for the "Love Letters" quilt or is there a kit available with that fabric? Thanks! I have finally finished my hand appliqued version of Holly & Mistletoe (When the Cold Wind Blows) and am getting ready to put on the scalloped binding, so I was glad to see more info on this. 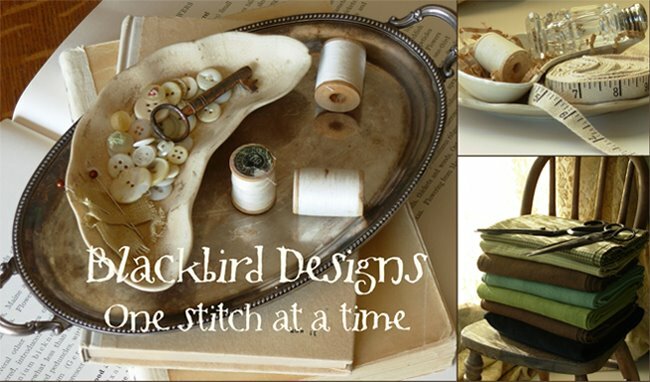 I am a Blackbirds Designs junky and spent a year hand appliqueing the Home Sweet Home quilt. My neighbor also made the Holly & Mistletoe quilt and then she cross stitched 3 of the HSH houses for me! What a friend!I am a topper and the Amish hand quilt for me, so I can move onto the next project. Can't wait for your next book. Thank you! Glad to find you in the blogospere. Your site looks inspiring. I will look forward to your posts.. I just purchased Joyeux Noel and saw your post to request Nicoletta's strawberry? "(Don't forget to e-mail me if you purchased the Joyeux Noel book for her missing strawberry pattern!)"